What is the answer to this statement? The same statement can give two different answers, mathematicians agreed that everyone would use the same order when solving problems. Remember: Multiplication and division rank equally (go left to right). And same goes for addition and subtraction. They act like a grouping symbol, not when they are representing multiplication. 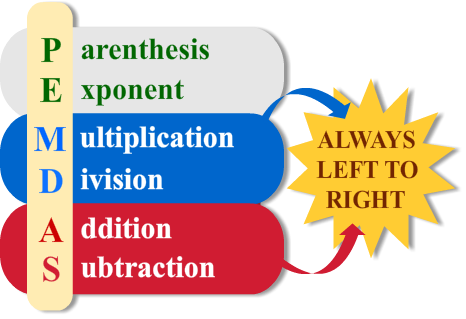 When a parenthesis is written right next to a number or variable with nothing in between, this means multiplication should be done in step 3. If there is any symbol in between, it is a grouping symbol and must be done first. For example, 8(4) means to multiply 8 and 4 since there is nothing between 8 and the parenthesis. But there is no multiplication in 6 + (4 - 1). Since there is a '+' sign in between 6 and the parenthesis, the parenthesis are a grouping symbol, so subtract '4 - 1' first. Let's illustrate through an example used above. 17 , because, according to order of operations, we must multiply 3 x 5 before we add 2. If someone wants to add 2 + 3 first, how would they do that? Then, the answer would be 25. Find the answer using order of operations. Using the order of operations, solve the expression. So, 18 - 2 x 3 = 12. So, 29 - (2 + 6) = 21. So, 7 - 18 ÷ 9 + 1 = 6. So, 16 ÷ 8 x 3 - 1 = 5. We use PEMDAS to solve order of operations. Use "Please Excuse My Dear Aunt Sally" to remember the order PEMDAS. Multiplication and division rank equally (got left to right). And same goes for addition and subtraction.